I'd like to enter my own designation. I would like to enter details about an organization not already listed. My billing information is the same as my contact information. My Employer can match my gift. This is an anonymous gift. By selecting this option, your name will not be published on any donor honor roll. This is a joint gift. We are grateful. Grateful too are the patients who benefit from life-saving care and discoveries; the physicians and scientists who are able to pursue lines of inquiry that lead to those discoveries; the students who are provided with an education that sends them out into the world ready to make it better. Mail your gift to the address below or learn more about how to make a gift. 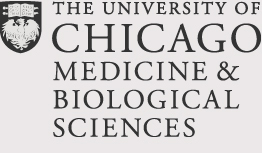 The University of Chicago Medicine impacts the lives of people through world-class clinical care, medical education, and scientific breakthroughs. To learn more about ways you can support these initiatives, please contact us at GivetoMedicine@bsd.uchicago.edu or call 773.702.6565. The security of your information is very important to us. Our Secure Socket Layer (SSL) encryption technology protects the security of your online gift information. When you share your support you magnify the impact of your gift by inspiring others to give. The details of your gift and private information will not be shared.